When a sneaky prankster removes the word "fat" from Flo's "Fat Free Breakfast" sign, a huge wave of hungry DinerToons overrun the diner causing it to explode! It's up to Flo, the spunky waitress, to move outside the diner and serve food to customers anywhere and everywhere she can! Find creative places to seat customers, take on outdoor disasters, and do everything in your power to keep customers happy. 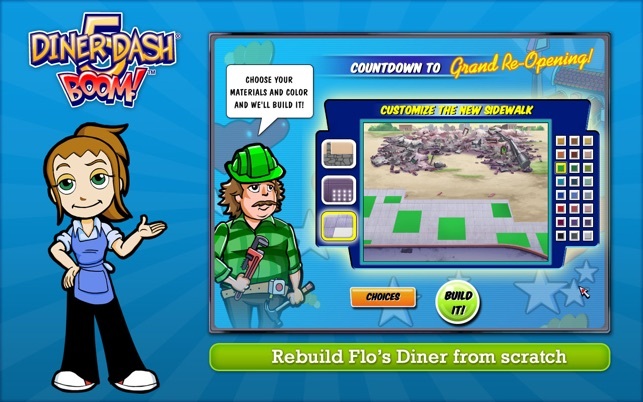 Can you keep up with the demand and earn enough money to rebuild and decorate a new diner from scratch, or is Flo's Diner gone forever? 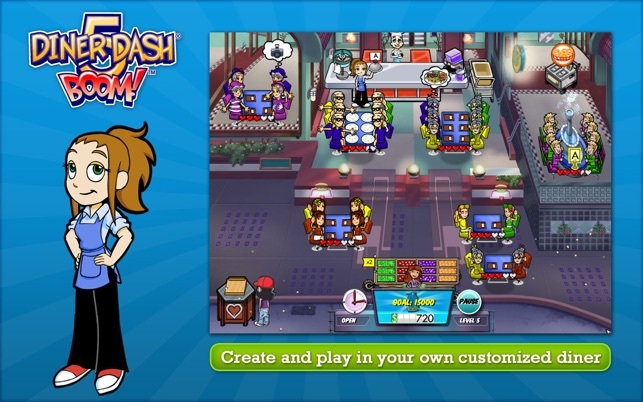 Diner Dash 5: BOOM! has been updated! With 8 newly added cinematic videos throughout the game, see the full story unfold as Flo sets out to serve the people of DinerTown and rebuild her diner! Cinematics are complete with animations, full audio, and voiceover. The game is fun. 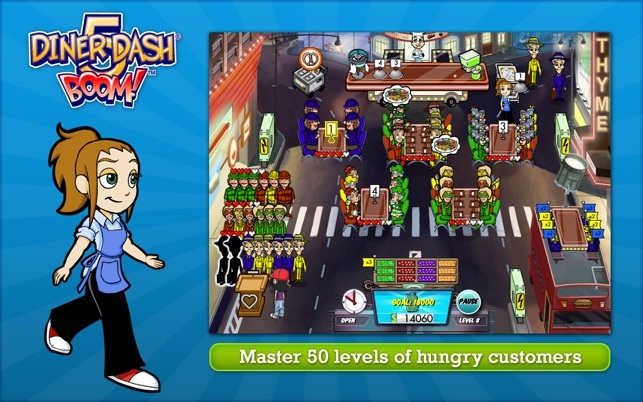 If you ever played a Dinner Dash game you are sure to like it. The game has a plot of a diner having to remake itself. It could be expanded, but I know that is not the point of the game. The game is mostly clicking onitems in the right order, while keeping the customers happy. I enjoyed it for what it was - a 4 game. I just have one major problem. There seems to be a bug in the game. There are small video clips in this game, but gettiing out of them is tricky. It seems like it should just go right into the game after the clip, but it doesn't. It just plays the clip and if you press the screen it replays the clip. After some finagling, I found a way around this. I had to press the full screen button (even though I was already in full screen mode) twice, usually. Then, once the name popped up in the corner I had to click on it and oress quit. It would ask if I was sure, and I would say no. Then I would finally be into the game. I would then go into the opptions to get the game back into full screen. This really needs to be fixed. I think the game is priced about right, as long as you manage to actually get to play the game. 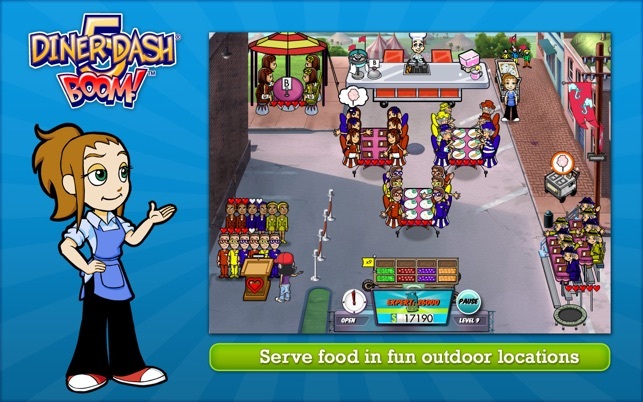 I've always loved the Diner Dash games, and this one is really great! It's challenging enough if you're using the track pad. With a mouse, it would be significantly easier. I haven't had a problem with the graphics or anything on my 13" MBP. It all looks great! I think it's definitely worth $6.99. People might think it's too short so it isn't worth the money, but if you don't sit down and play the game beginning to end, then it's a really fun way to relax for a few minutes here and there. And this is the type of game that's fun to go back and play all over again because you can try and beat your previous score! I totally recommend purchasing this game! Buyer beware..it's addicting! 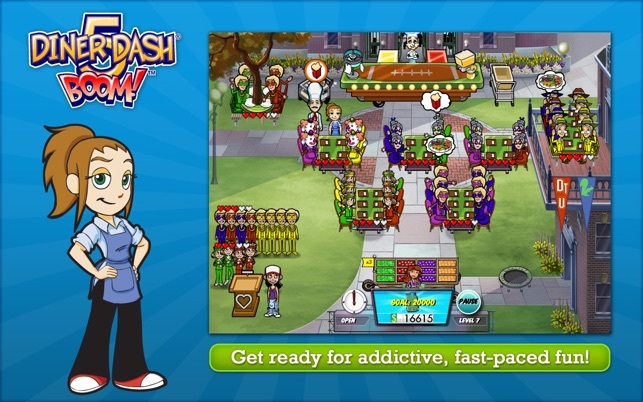 I usually love the "dash" games...and I was looking forward to trying this one on my macbook pro. 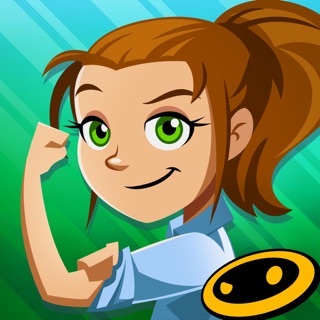 I am finding it a bit annoying to not be able to easily replay levels without going through the intervening "build a diner" segues and the "buy upgrades" intros to each level. Plus, when I do go back to replay a level, the game doesn't remember how much was in the bank last time in the event that I want to buy an upgrade. Just doesn't seem as smooth as the past games. I do like playing on the larger screen, but not sure that makes up for the awkward pauses in this game.